Weaker economic conditions and political volatility in some markets saw the value of Scotch Whisky exports decline 7% to £3.95bn in 2014 from £4.26bn the previous year, according to new figures published today (1 April). The Scotch Whisky Association (SWA) called on the European Union and the future UK government, no matter the political complexion, to continue to press the case for more open markets, and to pursue ambitious Free Trade Agreements (FTAs) to promote exports. The SWA pointed to existing FTAs, such as the EU agreement with South Korea, which have boosted growth and to the huge potential of agreements with countries including India, the US and Vietnam. Scotch whisky has enjoyed strong global growth over the last decade, with total value of exports up 74% since 2004 and Single Malt up 159%. But the SWA reported challenges in several markets last year, with the volume of exports also down slightly by 3% to 1.19bn 70cl bottles. The overall picture, following several years of record-breaking growth, was consolidation in many developed markets and underlying strong growth in most emerging markets. Political volatility affected this picture in places and some fluctuations were driven by changes in stock levels rather than by underlying consumer demand. Growth was seen in a range of important markets, such as Taiwan where exports jumped 36% to £197 million, partly on the back of the growing popularity of Single Malt Scotch. Exports to India were up 29% to £89m, despite the 150% import tariff. Exports to the US, the biggest market for Scotch, fell 9% by value to £748m. However, customs export figures did not tell the whole story, as consumption figures released earlier this year by the US Distilled Spirits Council show the market shrank by only just over 1%. Single Malt sales volumes were up 6.3%. This suggests the fall in exports in 2014 was due partly to stock adjustments - as high inventory levels of Scotch are drawn down to meet consumer demand, rather than buying new stock – as well as to an increasingly competitive spirits market. Global exports also performed better in the second half of last year - down 4% - than in the first six months when they fell 11% in value compared to the same period in 2013, suggesting longer-term fundamentals are sound. Exports to France, the biggest market by volume and second biggest by value, were up 2% to £445 million and 3% to 183m bottles. 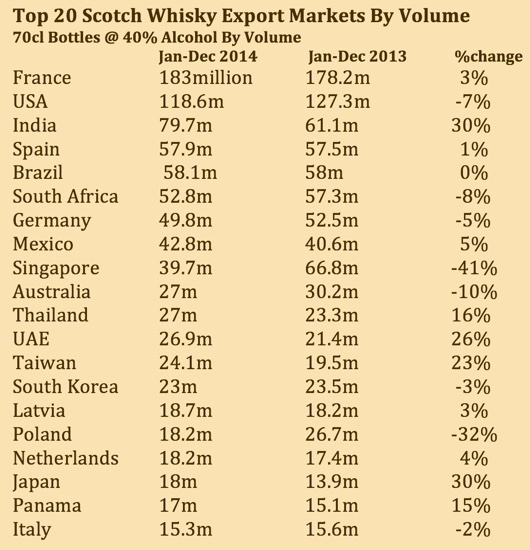 The French market is stabilising after Scotch, and other imported drinks, were hit by a tax increase in 2012. Exports to Spain were up 1% by volume for the first time in several years. There was a mixed picture in emerging markets, partly as a result of political and economic volatility. Exports by volume to Mexico grew 5% to 42.8m bottles, while value fell by 10% in that market. There was a similar trend in Brazil, with volumes flat but value down 20%. The important hub market of the United Arab Emirates continues to boom, with exports up 27% by value. Exports to Thailand were up 16% to 27m bottles. Japan was up 8% in value to £64m, the first increase since 2011. South Korea was up in value to £117m, the first increase since 2010. South Korea was given a boost by a FTA with the EU in 2011, which phased out the import tariff. The Association stressed the importance of pursuing ambitious FTAs to open markets and support export growth. There are a number of on-going negotiations which should benefit Scotch Whisky, including the EU-Vietnam FTA expected to be signed this year, an agreement with Colombia and Peru due to come into force and an agreement with Canada. The SWA urged the early re-opening of negotiations between the EU and India and progress on other important negotiations, such as the EU-US Trade & Investment Partnership. David Frost, SWA chief executive, said: “Economic and political factors in some important markets held back Scotch Whisky exports in 2014 after a decade of strong growth. It shows that the industry’s success cannot be taken for granted and that we must continue to argue for more open markets and ambitious trade deals that tackle barriers to market access.